Toshiba has this week announced the launch of its latest mobile internet device – the AC100. Packing Android 2.1 but lacking touchscreen capabilities, Tosh is calling the AC100 something that "combines smartphone functionality with netbook usability." Now don't get to excited thinking that your can use this MID as a phone, as the actual smartphone part is that it uses Android and has instant on capabilities. Its 10.1-inch screen is where the netbook part comes in. The AC100 makes use of a 1GHz NVIDIA Tegra 250 Mobile Processor – which is great for a smartphone but rather low if you compare it to the standards of a normal netbook. This is no normal netbook, however. It weighs just 870g and is 14mm at its thinnest point. 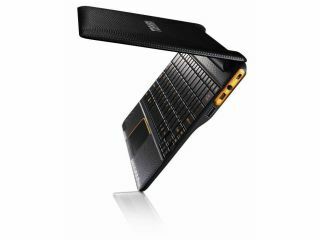 In short, the AC100 is meant as a take-anywhere device which has a LED backlit screen, full-size keyboard and all the widgets that Android 2.1 allows. Pre-installed on the AC100 is Documents to Go, which allows you to view Microsoft Office documents. This is upgradeable so you can edit them as well. Opera Mobile is also on board to make sure that web browsing is swift and there's support for POP3 email client, IMAP and Exchange. Memory-wise, there is 512MB RAM on board and storage comes in the form of 8GB Flash. Connectivity is as follows: 1 x USB 2.0, 1x Mini USB, Card Reader (SD, MMC), Audio out/Mic in combo socket, HDMI. And for the internet there is optional 3G, Wi-Fi and Bluetooth. With pricing still to be revealed, the Toshiba AC100 has a UK release date of August.